I’m often asked how to measure people. Managers, executives and human resource professionals all want to know how to cascade company goals to individuals, and put measures in their performance agreements. It’s the toughest question I am ever asked, because my answer isn’t what they want to hear. The way that I learned that 90% of the problems are in the process and not the people was through training in Six Sigma, Total Quality Management and other process improvement methods in general. This concept was very central to the ability of many organisations to make great progress on improving productivity, quality and financial performance. They focused on measuring and improving processes, and rather than treating employees as an asset to get a return from, they treated them as people. They gave them opportunities to learn and grow and apply their skill and creativity to collaboratively make the processes work better. Now I want to ask you what you have noticed happens when you measure people to monitor how they perform. Be honest and comprehensive. Have you seen it truly work? I’ll bet you can’t produce any evidence that measuring people is the best way to reach company or organisational goals. And besides that, if 90% of performance problems are in the process, wouldn’t you want to master the measurement of processes first, before worrying about measuring people? Really? No measures of personal performance at all? 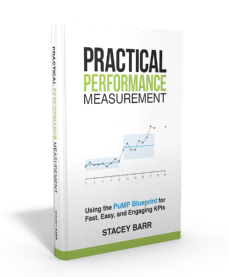 It’s not that you can’t measure a person’s performance. You can measure anything at all if you can frame it as an observable result. The contention I have is more about why you’d want to measure a person’s performance, and how you go about doing it. I detest the idea of treating someone like an organisational asset, something you are trying to control. Managers should be collaborating with employees, not trying to force performance out of them. But measures can help individuals to improve their personal performance, when those measures are chosen and used by the individual, not chosen and used by someone else to judge the individual. It’s simply a matter of the individual deciding what their goals or desired results are, in a work context, and how they’ll monitor them. Read more about measuring individual performance, and take some time to ponder it’s real impact in your organisation, before assuming it’s necessary. Just because it’s popular, doesn’t mean it works. This is really interesting! Having worked for sometime in performance measurement, I definitely agree with the premise. Our large public sector organisation is focusing on cultural change at the moment, following some quite significant structural changes. One of the ideas I have been tasked with investigating is that of a feedback process, from all levels of the organisation, for leaders in how well they model desired behaviours. I will definitely incorporate your suggestion of a personal measurement, and do you have any advice for a ‘bottom up’ feedback mechanism?